Patient Capital: Is Pastor Paul Our Own Jeff Bezos? The story of the Amazon we all know (and mostly love) today is an amazing one. Jeff Bezos started the company in June 1994 and called it ‘earth’s biggest bookstore’. However in the first 6 months of its operation, it barely clocked $500k in revenues. But by 1996, it had sales of $16m and in 1997 it sold $148m. Impressive numbers no doubt but there was a problem behind those numbers – the company was seriously losing money and burning through a frightening amount of cash in the process. By 1999 it was making revenues of $1.6bn but managed to lose $720m on those same revenues. By 2001 its losses had doubled to $1.4bn and it had racked up $2bn in borrowing from banks plus around $8m the initial investors had put into it. 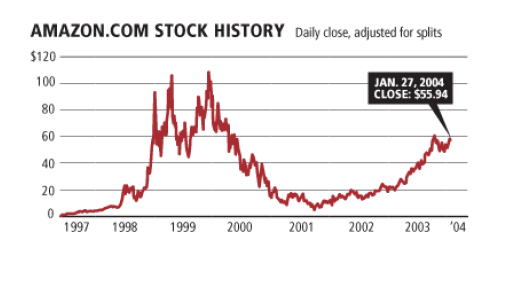 Notice the precipitous drop in the share price from a peak of $115 around 1999/2000 to around $5 or so in 2001…all in just over a year. Just imagine you were an investor and you bought at $100…imagine the kind of reports that would have been written by analysts and so on. By 2001 when it made the huge losses referred to above, it sacked 1,300 workers, closed down two of its warehouses and shut down other service centres. Somehow, in January 2004, ten years after the company started operations, it managed to post its first annual profit of $35m on revenues of around $6bn. Phew! And the rest as they say is history. These days its revenues are around $61bn a year and even though it still makes a loss now and again, it is such a part of the internet fabric that no one panics anymore. The company has almost singlehandedly redefined what the term ‘patient capital’ means. Somehow in all those crazy years when it looked like a lot of money had gone down the drain, Jeff Bezos managed to convince investors and lenders to stick with him. One of the things that makes America almost unique among capitalist countries are stories like these – the way people will back a company with billions of dollars and stick with it even when it is losing a fortune. Sometimes they don’t even make their money back and the company goes bust along with everything invested into it – a good example was an online grocery delivery company called Webvan that went bust in 2001. I left Nigeria very early in 2004 and I know definitely that work on The Rock Cathedral had already started. The papers are awash with stories today about the President, Goodluck Jonathan, as well as Tony Blair, former British Prime Minister, opening the now finished church yesterday. The number being touted as the cost of the construction on social media is $85m. It is an impressive building and will sit 14,000 apparently. When you think about it – ‘investors’ have been pouring money, by way of offerings and building funds, into this project for maybe 15 – 20 years. Let’s say yesterday when it was commissioned was the day it finally turned a profit to complete the picture. Friends, is the difference between us and the Americans only where we choose to deploy our own patient capital? There’s no doubt about this – we do have patient capital in Nigeria that can nurture a business or project through impossible times till it finally comes good. People were investing their money into this project for years based on no more than the model and 3D images perhaps. I have never been a member of House on The Rock but I can only imagine how many times Pastor Paul would have asked for more money or plans would have changed over the years. Just like Jeff Bezos. In my head, I like to think of capitalism as a 2-step thing – aggregation and then deployment. First you round-up all the people who have money and find a way to make them give it up (willingly). These can be small sums and is what banks essentially do with your deposits. Aggregation helps you to build up the gunpowder that is capital leading to the deployment stage i.e who do we give it to? There are 2 clear examples in Nigeria that show we are doing the aggregation part of the equation ok. The first is of course how our churches manage to raise vast sums of money at zero rates of interest just like the $85m above. You only need to go to a Holy Ghost Night programme or a large church in Nigeria to see how capital is being raised from investors on a weekly or monthly basis. Most of the large Pentecostal churches don’t publish accounts so we can only assume billions are raised this way every Sunday. The other example is our Pension Fund system. Nigeria adopted the Chilean model in 2006 and since then total pension fund assets have grown from $1.8bn to $19bn as at November 2012. We now have 5.3 million Nigerians aggregating around $100m in capital per month into pension funds. And given our population size, there’s potentially plenty more to come. This is where it all breaks down unfortunately. The deployment stage. In the case of pension funds, most of it still gets lent to government (although that is very slowly changing) and for churches, well buildings get built and other things get bought. Nigerian respondents cited access to finance as a key challenge for starting and growing small businesses. In particular, the requirements for obtaining capital are prohibitive. As illustrated in Figure A13, Nigeria marginally lags her SSA peers with regard to financing, while the gap to global peers is more pronounced. I highlighted ‘equity capital’ above. This is pretty much another name for patient capital. Not only are we doing much worse than our global peers, we are also alarmingly lagging our peers in Sub-Saharan Africa when it comes to financing enterprise. Surely none of these our peers even globally can match the grandeur of our churches all built with patient capital? The challenge for those of us who want to see enterprise bloom in Nigeria is how to mimic this church model to patiently fund businesses. Should entrepreneurs learn to sell their vision to investors like Pastors? Should we organise overnight investment conferences that somehow convince 50,000 people to attend and then get them to make a contribution before they leave? Or maybe there’s nothing wrong here and I am just making a mountain out of a molehill. Maybe Nigerians are perfectly rational after all and having considered all the various investment options available to them (and there are legion), they decide to put their money in churches where they are certain of the best returns. Maybe Pastors are the only entrepreneurs that people feel comfortable backing even when things aren’t going to plan. Maybe Pastor Paul is our own Jeff Bezos after all who can convince investors to open their wallets again and again. The Vanguard Newspapers has an editorial, chock full of brio and righteous indignation, about the government’s (admittedly still vague) plans to sell or concession or privatize the National Theatre in Surulere. The editorial rehashes the usual arguments about the (unspecified) evils of privatization and unwittingly makes a case for the continuation of the status quo that has led to the current sad state that the theatre is in. Editorials like these help to buttress the widely held view that Nigerian newspapers have no idea what their role in society is and they assume that their readers couldn’t possibly know better. This is a bizarre argument to make. Hyde Park is a park (the clue is in the name) and it makes no sense to compare that to the National Theatre. Wembley Stadium is owned (nominally) by The Football Association and there is a reason why it costs so much to watch a match or attend an event there. The ‘government’ ownership is an illusion as it is run like a privately owned stadium. Looking at the latest set of accounts for The FA from 2010 (page 37); you can see that the stadium generated £92.3m but still made a loss of £12m for the year. Why? A £23m charge for interest payments relating to the loan that was taken to build the stadium. But since the company that runs the stadium, Wembley National Stadium Limited is part of the group, you can see on the same page that the group overall still made a profit of £15m for the year, in other words, the losses are being subsidized not by the government, but the money spinning FA. How exactly does this arrangement support the Vanguard’s argument? How about the Royal Festival Hall? Again, thankfully, the accounts are public and it discloses that in 2012, the RFH had income of £42m (page 12). Of this amount, £19m came from the Arts Council (the Arts Council itself is part funded by the government with around 35% of its funding coming from the lottery and investments. See page 57 here ) while the rest of its funding comes from events and other sources like charitable donations. The point to be made about these examples is that they are not ‘government run’ in the way that we understand the term in Nigeria. The amount of disclosure that is available on the internet about their activities is a useful hint to this. For ease I have done a quick chart with the budget allocations for the last 4 years I could find on the internet. Note that these are the allocations to the National Theatre via the Ministry of Culture. 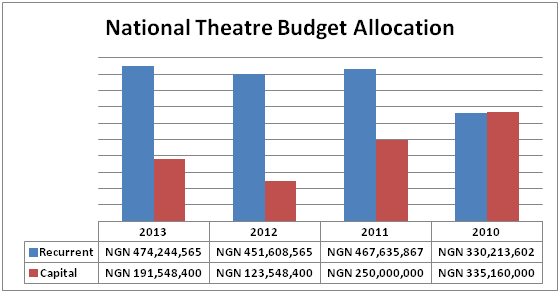 What is immediately obvious from these numbers is that, it is not that the government is refusing to fund the National Theatre. Over the last 4 years, those numbers add up to almost N3bn (around £11m). The problem here is that the money is captured by those who have positioned themselves in the money’s path on its way to the actual theatre. This is what you are defending when you say the government should continue to fund the theatre or increase it’s funding – you are simply calling for a transfer of wealth to a few lucky people. This is the real cost of keeping it in government hands. Last week, it was widely reported in the papers that the government had come up with some plan to add a hotel and mall to the adjoining area of the theatre. Depressingly, this has been met with the usual howls of ‘preserving our heritage’, as if the current state of the theatre is something to be proud of. The place continues to decay as money is being poured into it, yet there are loud cries whenever any kind of change is proposed. The question to ask is – who is going to die if the theatre is privatized or concessioned? Is this really such a strange thing to do? In using examples from the UK in its editorial, The Vanguard missed out a glaring one – The O2 Arena formerly known as the Millennium Dome. The Dome was initially conceived during the government of Prime Minister John Major in 1994. Afterwards, Tony Blair’s government expanded the size and scope in 1997 and eventually and eventually it was opened on 31st December 1999. As soon as it opened however, it soon became clear that the project was fast turning into a white elephant as visitor numbers were well below what had been planned not to talk of the cost of maintaining the place. By 2002, the company which was set up by the government to fund the Dome’s construction was liquidated with a final bill of £790m and the Dome was closed down. Even while closed, it was costing the government £1m per month in maintenance. Fast forward to 2005 and the Dome had been sold to the billionaire Phillip Anschutz of the eponymous Anschutz Entertainment Group (AEG) who then spent a further £600m completely changing the design (pretty much only the shell was kept the same) before finally opening it to the public in 2007. Most Nigerians visit The O2 Arena when they visit London but what is even more interesting is that the Arena is nominally a concert venue yet a very large number of people go there without attending a concert. I have been there more times to hang out with friends or for a meal than to actually attend a concert. And this is very important – the idea of some kind of grandiose theatre that only draws a core of visitors is by no means sustainable. This is why the idea of a hotel or a mall on the premises makes very good sense. You need those people to effectively subsidize the whole operation but they have to come first. You don’t even have to come to London to see a similar working model. Just up the road is the MUSON Centre. Surely there are far more people in Lagos who have attended a wedding or party at MUSON than have attended a stage play or musical recital there? Yet without these weddings and parties, does any reasonable person think the venue would still be financially solvent now? The O2 Arena is surrounded by restaurants, bars, a cinema and other shops. It cannot rely on Beyonce concerts alone to keep the place going. There has to be the ‘daily bread’ aspect to its existence. And it’s just not about money even – the place has to have life and character and you need people to keep coming for that to happen. The National Theatre was built to host events and stage plays. But there are simply not enough of these to capture the public’s imagination leading to it being turned into a wedding venue. But even this has been turned into a mess because there is no incentive to run it like a proper going concern as this will mean the loss of government funding…and of course the vested interests don’t want that do they? The last time the government tried to privatize the theatre in 2001 there was so much outrage and defence of the status quo, depressingly led by Professor Wole Soyinka which forced the government to eventually abandon the idea. 12 years on, can anyone say the place has improved after billions have been poured into it? Privatizing the theatre doesn’t mean that it becomes a private space where no one will be allowed to enter. If anything, the incentives to draw people into the place become far greater under private ownership. What the debate should be about now is ensuring that whoever takes over the place produces a workable plan – with the numbers adding up – that ensures the theatre is kept open and increases the number of visitors to the place. But the idea of jumping up to oppose privatization everytime it is mentioned belongs to another era. The government cannot do anything other than sink money into the theatre with nothing to show for it. The government is right on this one. Sell the theatre. The heavens will not fall.